Everybody has their favorite season. Spring is a joyous time of rebirth when your spirit will come alive along with the sprouts of green popping up in your yard. Days get warmer and we rejoice in the spring breeze. Summer brings the pleasure of outdoor activities when the world is alive with sun and you reap the harvest of your garden. Winter is a time for introspection. You enjoy days of sipping spirits by the fire, long naps and catching up on your reading. Ahh, then there is autumn. You can retreat from long, hot days and enjoy vigorous hikes. The air is crisp and the landscape is ablaze with dazzling color. Campfires keep you toasty, marshmallows get roasted and the stars seem to get brighter. This is also a good time for choosing trees and shrubs for fall beauty to plant now and enjoy next year. If you appreciate the color of autumn, you will want to know about these tried and true trees and shrubs that will add incredible vibrancy to your own landscape. Plant one….or two….or three and next year your fall landscape will be even more alive. These elegant trees offer an outstanding glow of yellow in autumn. Their beautiful fan shaped leaves are a show stopper in the foliage world. They are related to conifers and thought to be living relics because they are a survivor of varieties that thrived over 200 million years ago. They can grow upwards of 80 feet, but most stay below half that height. And they are slow growers so if space is tight, you won’t have to worry about them pushing beyond their boundaries. This lovely plant, sometimes called the smoketree, can be grown as a shrub or be pruned to the shape of a small tree. In June they will bloom with tiny yellow flowers and as petals fade, wispy stalks of pink hairs burst forth. This is what gives the suggestion of the plant being filled with smoke. The “smoke” will clear by fall and the foliage will take on a yellow or orange-red color. For a more scarlet red color, try the “Royal Purple” variety. For a bright orange, choose “Ancot”. If you want to double your pleasure, check out Witch Hazel. If delivers with flowers, a lovely fragrance and then colorful leaves in autumn. Unlike most shrubs, this native plant first lights up the fall landscape with yellow foliage and then blooms with flowers that stay on branches well past the shedding of leaves. The yellow flowers have the look of frilly spiders and smell of warm spice. This unique shrub provides thrills with interesting foliage and even more so with the bright red color of its stems after leaves have fallen. Many varieties have foliage that turn a lively red and a reddish purple, and during summer some have variegated foliage. There is also a yellow twig dogwood that has lovely fall color and both types have sweet clusters of white flowers in spring. The birds will love the small fruit that is produced. You can’t talk about choosing trees and shrubs that offer beautiful fall color without mentioning maples. Different varieties will offer amazing pops of color ranging from raging yellow, through all shades of orange to a dazzling deep red. While maples can get quite large, but if your space is smaller, don’t worry. You can also get beautiful color from Japanese maples which have a more diminutive growth habit. The name is a misnomer. There are no actual red buds but rather sweet pinkish-purple flowers in spring. The heart shaped leaves are beautiful all summer long but in fall they will turn a shimmering yellow. The “Forest Pansy” is a remarkable variety of redbud that has deep plum foliage all the time and in winter long mahogany seed pods dangle from bare stems. This is a terrific shrub throughout the seasons. In the spring you’ll be impressed with white flowers that resemble apple blossoms. Late summer brings deep red tiny round berry-like fruit and then in autumn the foliage changes to a stunning red-orange. If you’re choosing trees or shrubs to fill up an empty space in your landscape, chokeberry will do that with a mature size of 10 feet tall and about 6 feet wide. So many good choices. But if you pick from the above list for your own yard and garden you can’t go wrong. 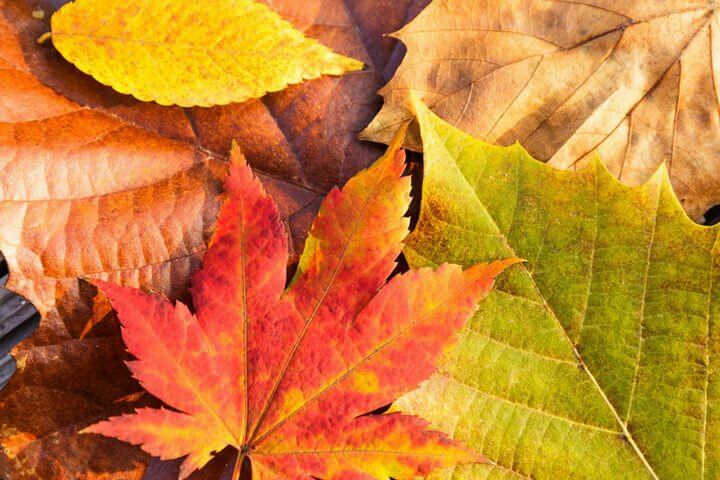 Next autumn – let the color begin!